I love the listening experience of vinyl, for one reason the short play time of a side forces me to sit and listen to the music. Because within 30 odd minutes, I'm going to have to cue up another side, so I might as well stay in place and not wander away too far. Where as running off a digital disc or playlist allows for a long session of uninterrupted listening, but then I drift off and start to multi task and that is the end of the immersive musical experience. Thus listening to vinyl has become a bit of a sacred experience for me, and just the thought of digitizing vinyl seems like something of an anathema. But many of my beloved vinyl albums are not available on digital mediums and perhaps never will be, and there have been many a time when away from home I'd love to listen to one of those albums and I wish I had a digital copy on hand. 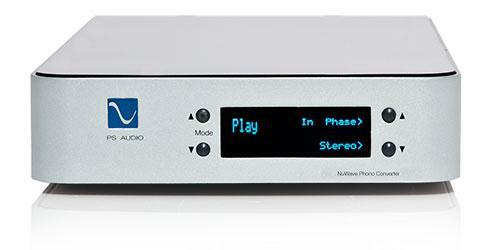 Enter the PS Audio NuWave phono, a very serious phono stage combined with a versatile ADC as well. Although, this review covers the phono stage performance only, it is not to be forgotten that this unit also doubles as an ADC as well. Perhaps sometime in the future I'll do a review series of ADC units. The concept for the NuWave phono is to combine an analog phono preamplifier, with a Analog To Digital Converter, with a massive power supply, and provide fully balanced class A analog outputs as well as multiple digital outputs including DSD and PCM. Pretty versatile I'd say. The analog section is a balanced, class A phono stage from input to output. The RIAA curve is applied in the analog and not the digital section. The ADC provides sample rates from 44.1kHz all the way up to 192kHz and bit depths from 16 to 24 bits in PCM format, or standard or double rate in the DSD format. While the output can be selected from the choices above, the input sample rate is fixed at five million samples per second, combined with a 6dB/octave input filter starting at 100kHz. Asynchronous 192/24, and 64X or 128X DSD can be sent over S/PDIF through either the USB or coaxial output and a direct DSD and PCM streams are available through the I2S output. All but one of the tests were done using the Ortofon Quintet MC Black (review upcoming). For direct comparisons I had on hand the Cambridge Audio 640P MSRP $180USD, and the Lehmann Audio Black Cube SE (review upcoming) MSRP $930USD. I used my usual method of listening to small segments several times on one device and then repeating on the other devices, this entire process is repeated several times till the differences between the components are repeatably and reliably noticeable. It takes me several hours to complete my listening on just one track. This minimalist recording is a pressed on 180g single sided LPs, and is a great showcase for female vocals and several acoustic instruments. This was the only test was done using the previously reviewed Ortofon 2M Blue. On the Cambridge Audio at first listen I was very impressed by the cartridge and phono stage that I have been using for some time now. Especially by the huge amount of detail in the female vocals, having all those nuances and subtleties reproduced makes the experience that much more realistic and immersive. But after listening to the other phono stages I began to notice that the piano leaned slightly towards the dark and slightly veiled in comparison, but keep in mind the huge difference in price point here. Even the legendary value of the Lehmann Black Cube is about five times as much. The PS Audio threw the widest soundstage of them all, and detail and resolution seemed a bit better than the Cambridge Audio as well. The Lehmann Audio however presented a considerable upgrade from both the other devices, there was way more seperation on the notes, vocals much more natural and nearly 3D somehow, quite a bit more detail and dynamic range. The Lehmann though also had the most background noise, especially compared to the PS Audio. With the Cambridge Audio [55dB, 100ohm] the results were surprising. This unit is not intended to handle the lowish 0.3mv of the Ortofon Quintet MC Black, but nevertheless it did a surprisingly good job. There was no detail missing, just the shortcoming could be described as it being more of a 2D rendition rather than a full 3D like the other units here. On this track for example, the sympathetic strings were audible if you were listening for them, but lacking clarity and dimension when compared to the units. The PS Audio [66dB,60ohm] was much more involving than the Cambridge. There was a lot more detail throughtout the frequency range, and notes seemed like there was another dimension added. The ornamentaions on the notes were much more vivid and the sympathetic strings were much more audible than on the Cambridge, but lacking detail and vividness compared to the Lehmann Audio. The Lehmann Audio [66dB, 100ohm] delivered a substantial improvement compared to the PS Audio, note plucks were now palpable and the transient response was incredible. The reproduction through the Cambridge Audio[55dB, 100ohm] had the most trouble with the double bass, and the overall presentation sounded much more 2 dimensional that the other units. The PS Audio [66dB,60ohm] had a much better separation of instruments than the Cambridge Audio, but the double bass is still a lump of slop albeit not as distorted as on the Cambridge. The Lehmann [66dB, 100ohm] delivered the best separation of instruments, and the double bass was easiest to recognize compared to the other 2 units. The presentation of the PS Audio [66dB,60ohm] made the instruments seemed more distant than the Lehmann, but there was a huge improvement from Cambridge on dimensionality and separation of instruments and notes. Through the Lehmann [66dB, 100ohm] the bite on the brass instruments was unmitigated, to the point that I ended up lowering the volume a bit to take the edge off. I suspect the Lehmann presents things as is, but the down side that is sometimes the presentation does not get the benefit of taming that maybe preferable or even needed. But on the plus side the dynamics were superlative, and the instruments seemed to jump out and were very palpable. I use this track to dissect the tonality of a solo acoustic guitar, with plenty of micro dynamics and soft passages. Also, this copy is very very worn and is also used to inspect the playback of surface noise. The PS Audio [66dB,60ohm] again delivered a lot more detail and dynamics than the Cambridge, it was easy to notice an added 3rd dimension to the music. However, the PS Audio could not hold a candle to the Lehmann. The Lehmann [66dB, 100ohm] extracted as much life as could be possible from this old, worn and noisy copy, and way more than I have ever heard. 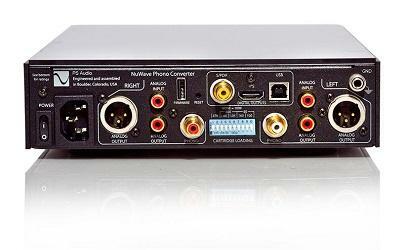 The PS Audio NuWave Phono provided a considerable improvement over the venerable Cambridge Audio 640P. In general, there was a lot more detail throughout the frequency range and seperation of notes was vastly improved too. Dynamics were hugely improved, and instruments seemed three dimensional whereas with the Cambridge Audio the presentation seemed flat by comparison. Compared to the Lehmann Audio Black Cube SE, the PS Audio did not fare as well sonically. I much preferred the performance of the Lehmann Audio as detailed in my notes above. From a value perspective, it cannot be forgotten that the PS Audio also is a pretty nifty ADC unit too. That must be taken into account for prospective buyers.